Absent thumb, or “thumb aplasia” is a total absence of the thumb. Some patients may present with a hypoplastic thumb or "floating thumb." In these patients, their thumb is missing the metacarpal (bone) and associated muscles and tendons. The thumb is only attached through the skin. Congenital underdevelopment of the thumb is frequently associated with partial or complete absence of the radius. It occurs in 1:100,000 live births with bilateral involvement (both hands) in 60% of patients. It is more common in the right hand than in the left for unilateral cases. The presence of an opposable thumb is useful for the manipulation of everyday objects. Children born with this condition adapt quite well with few limitations. The decision to undergo surgical intervention, therefore, lies with the parents. Surgical treatment for complete absence of the thumb involves a pollicization surgery. 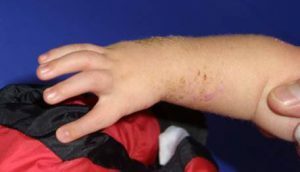 At the Paley Institute we can comprehensively address all of the deformities associated with absent or hypoplastic thumb. We offer pollicization surgery to reconstruct the thumb, as well as limb lengthening of the radius and deformity correction for associated deficiencies. For more information on pollicization and surgical treatment, see Treatment Strategies. Please view our Patient Cases for before-and-after photos showing the dramatic transformations, as well as News Stories to see how treatment at the Paley Institute changes our patients lives.